Has the name for a perfume ever so aptly described the quality all perfumes share? Namely, that poetic condition of being something beautiful and rare yet momentary; evaporated almost as soon as we have contact with it. Other than the culinary arts, what other art has as its object something that disappears as soon as you apprehend it? 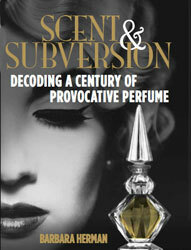 The story that brought me to this perfume adds another layer to its poetic name. Fleeting, too, are the notes that comprise the perfume. It is hard to tell what exactly I smelled when I first took a whiff. Soapy and aldehydic, but with a soft, organic, herbal base that smelled like nature refracted through synthetics, helping to blend, soften and blur the recognizable lines of the flowers and herbs. From what I could glean from the web, the primary notes are jasmine and thyme. Honestly, I smell neither of these prominently. I know what jasmine in nature smells like, and I know what thyme smells like, but Fleeting Moment is a different creature altogether, more than the sum of its parts. Other notes: Orris (Iris), Anise, Ambergris, Leather. Cellier fragrances open up from top note to basenote like a world-class orchestra right before it plays a concert. As an orchestra tunes up before a big performance, one is often treated to the sound of an off-key sounding violin, the trill of a flute practicing scales, a lone note from the horn section. But immediately, all those crude sounds blend together into smooth and harmonious. Cellier fragrances, too: it's as if she composed her perfumes to sound their notes first, and to assemble before our noses as the beautiful constructions they are. I may be making this up, but I get that sense every time I first take a whiff of a Cellier. I watch the perfume come together. What one blogger calls a "radiant herbal jasmine" (I concur) reminds me of a couple of things. One, it reminds me of the perfume version of a now discontinued (of course!) drink from the UK I used to splurge on, called Aqua Libra. This lightly carbonated drink was slightly sweet golden drink infused with herbs: tarragon, cardamom, thyme, sesame seeds. It was so interesting I felt like I was drinking perfume. The haylike scent that I smell in the drydown reminds me of Weil's Antilope and, perhaps due to the farnesiana (the flower of an Acacia farnesiana tree which is distilled to make Cassie oils used in perfumery)? I may not have tracked this hard-to-find scent down, though, if it hadn't been for a friend who showed me a tiny bottle of Fleeting Moment that had nothing of the fragrance left except its residue. She told me she found it among her mother's things, and that she liked to smell it to remind her of the woman she could barely remember who died when she was 7. In concentrated residue form, Fleeting Moment emerged from the bottle like a genie. There was nothing visible in it, but I could smell the perfume's gorgeous shining notes, recalling meadows, sunshine, and beautiful, if bygone days. UPDATE: I implicitly trust Octavian from 1000Fragrances and this is what he had to say about Fleeting Moment. According to him, it's not thyme but rather something tarragon-like that provides the aromatic, herbal nature that is so particular to the perfume. (This jibes with its association for me with the drink Aqua Libra. He also says that it pays homage to Chanel No. 5 in that it is a floral aldehyde, with less of a Chypre drydown. Top notes: citrus aldehydic with a slightly aromatic touch (tarragon like): bergamot, orange, aldehyde C10, aldehyde C11-enique, neroli. Middle notes: floral bouquet (ylang-fresh rose-jasmin) with a very light lily of the valley base (more modern than No5) and floral powdery notes (orris absolute and methyl ionones). Base notes: Soft woody with powdery and musky notes like vetiver (+the acetate), sandalwood, vanilla, sweet coumarine and musk (musk ketone and natural musk). (Thanks Octavian!) The Scented Salamander and Fragrance Bouquet (who categorizes it as a Chypre) also have interesting things to say about Fleeting Moment. Les parfums vintage de Balenciaga me fascinent. Ma maman possède toujours Quadrille dans sont flacon rond en extrait. Quand je lui rend visite je ne peux pas m'empêcher de le sentir. Thank you for commenting, Iris, Je T'Aime. If my French were better, I'd answer you en Français! Your comment inspired me to dig out my tiny bottle of Quadrille, which I'm saving to review at another time. Incredible. The dry down is like like velvet, plums, butter, and musk, and maybe patchouli or some other spice. Decadent and definitely vintage. So different from the translucent and delicate La Fuite des Heures...Thanks for stopping by!